March home prices at post-crash high as home sellers in March on average sold for $30,500 more than they paid, a 17% average gain. Copper Creek Homes is located in the Portland Metro Area, specifically Vancouver WA. 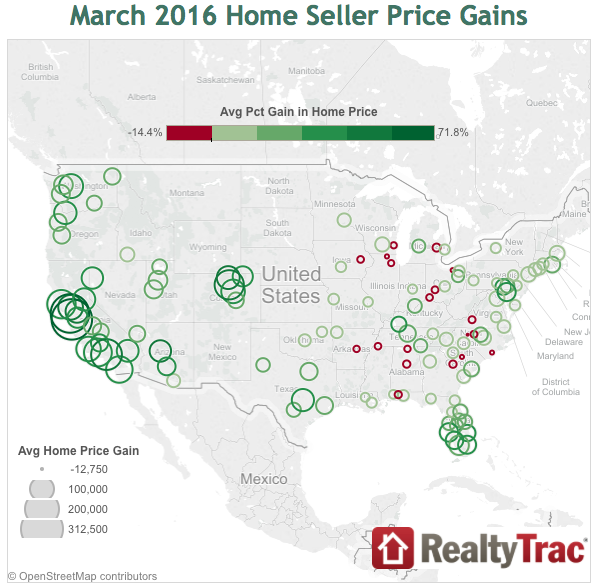 RealtyTrac, the Irvine Calif. purveyor of housing data, said Wednesday that its March and Q1 2016 U.S. Home Sales Report shows that U.S. home sellers in March on average sold for $30,500 more than they paid, a 17% average gain — the highest average price gain for home sellers in any month since December 2007 at the onset of the Great Recession. According to the report, among 125 metropolitan statistical areas with at least 300 sales in March, sellers netted the biggest average gains in San Francisco (72% average gain); San Jose, California (60%); Boulder, Colorado (53%); Prescott, Arizona (51%); and Los Angeles (48%). Rounding out the top 13 were Denver (42%); Portland (40%); Austin (40%); Seattle (38%); Baltimore (38%); Riverside-San Bernardino, California (37%);San Diego (36%); and Sacramento (35%). The median sales price of single family homes and condos in March was $210,000, up 9% from the previous month and up 11% from a year earlier. March was the 49th consecutive month with a year-over-year increase in the U.S. median home price, which is still 8% below its previous peak of $228,000 in July 2005. Among metro areas analyzed in the report, 36% have reached new all-time home price peaks since January 2015, including seven markets that reached new price peaks in March 2016: Boulder, Colorado; Denver; Portland; Fort Collins, Colorado; Austin, Texas; Greeley, Colorado; and Cincinnati, Ohio. He noted that banks are taking advantage of the market, causing an uptick in the distressed sales share over the last two quarters. “Given that bank-owned homes are selling at a median price that is 40% below the overall median sales price nationwide, the uptick in distressed sales combined with affordability constraints are contributing to faltering home price appreciation in some markets — most notably the bellwether markets of Washington, D.C. and San Francisco” Blomquist added. Still, there were laggards. In 19 markets (15%) sellers in March on average sold for less than what they purchased for, led by Rockford, Illinois (11% average loss compared to purchase price); Winston-Salem (10% loss); Cleveland (8% loss); Columbia, South Carolina (7% loss); and Wilmington, North Carolina (5% loss). The rest of the bottom 11 markets with average seller losses in March included Memphis (4% loss); Milwaukee(4% loss); Chicago (3% loss); Cincinnati (3% loss); Birmingham, Alabama (2% loss); and Flint, Michigan (1% loss). The RealtyTrac Home Sales report is based on publicly recorded sales deeds collected and licensed by RealtyTrac in more than 900 counties nationwide accounting for more than 80 percent of the U.S. population.